I love a lot of Neil's novels and when I saw this in my local book store I couldn't resist picking it up. 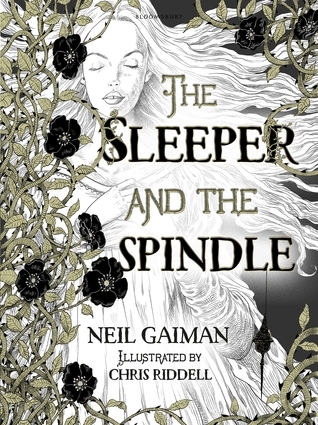 The artwork on the cover is so beautiful and I'm a huge fan of Chris Riddell's artwork anyway. This image shows as much justice as possible, but the cover is so much more beautiful in person - the gold is shiny in the light! I'm also a huge fan of fairytales and when I saw that this linked two of my favourites, I knew I had to get it. The artwork is the main reason I bought this edition. It's so beautiful and the colour scheme, a simple black, white and gold, is magnificent. I love how the illustrations match the slightly Gothic and creepy story line. What I love most about this, other than the artwork, is that it has a really interesting ending. It's unexpected and perfect and I really, really liked the twist. All I can say without giving too much away is that it is the complete opposite of your normal and well-known fairytales.